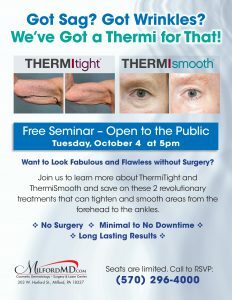 MilfordMD Cosmetic Dermatology Surgery & Laser Center to Host Seminar on Popular New ThermiTight, ThermiSmooth RF Technologies for Skin Tightening and Wrinkle Reduction. MilfordMD Cosmetic Dermatology Surgery & Laser Center, in Milford, Penn., has announced the cosmetic surgery practice will host a seminar, open to the public, on breakthrough radiofrequency-based ThermiTight and ThermiSmooth treatments. The October 4, 2016 seminar starts at 5 pm and includes not only education and demonstrations, but also gift bags with cosmetic goodies and exclusive treatment discounts for those who attend. In less than a month, MilfordMD Cosmetic Dermatology Surgery & Laser Center, in Milford, Penn., will host a free seminar, open to the public, on the minimally invasive cosmetic possibilities of the breakthrough radiofrequency ThermiTight and ThermiSmooth treatments. The October 4, 2016 seminar starts at 5 pm and includes not only education and demonstrations, but also gift bags with cosmetic goodies and exclusive treatment discounts for those who attend. ThermiTight fills an important need among cosmetic surgery patients. 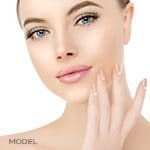 There are options for reducing fat and surgically tightening loose skin, but, until now, there had been few options specifically aimed at skin tightening around the body without traditional surgery. The technology has a built-in safety feature to monitor the level of heat being applied under the skin. The controlled application of heat is also monitored by a customized external infrared video camera, allowing Dr. Buckley to literally shrink the skin to where it was in a more youthful state—near the patient’s underlying bone structure. 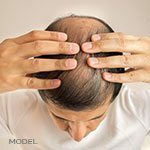 ThermiSmooth also uses radiofrequency technology but does not involve inserting a probe under the skin. Rather, Dr. Buckley tightens skin by heating the tissue from outside the skin’s top layer. It’s totally noninvasive. While the MilfordMD special presentation on ThermiTight and ThermiSmooth on October 4 is free and open to the public, seating at this event is very limited and reservations are required. To reserve your spot, call MilfordMD Cosmetic Dermatology Surgery & Laser Center at (570)296-4000.